A forensic document examiner was called Thursday as a witness to discredit signatures on a petition asking for a referendum to be placed on the November ballot. The referendum ask voters to overturn Concord Township’s recent zoning changes. Dennis Ryan presented his findings in some of the petition’s signatures in front of the Board of Elections. Also pictured with her back to the camera is Andrea Yagoda who defined the petition. Delaware County Board of Elections disqualified a petition Thursday that asked to place a referendum of the November ballot. The referendum ask voters to overturn Concord Township’s decision rezoning land for residential development. Concord residents presented a petition of 354 signatures to add a referendum to the November ballot asking voters to overturn rezoning applications for Riverside Highlands and Concord Highlands developments. Township trustees approved the applications during their May 17 meeting. Director of the Board of Elections, Karla Herron, said, “it took the better part of a week” to verify each of the 354 signatures that originally appeared on the petition. She said after verification the signatures had been narrowed to 285 which the board certified during their July 11 meeting allowing the referendum on the ballot. Protesting the petition, Metro Development LLC, Concord Development LLC, Riverside Highlands LLC. and Nancy Inman filed a protest against the petition July 14. 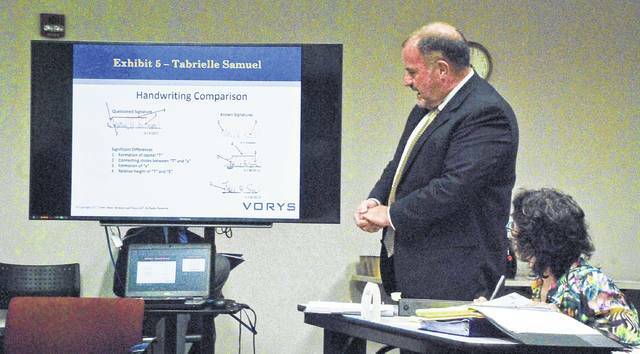 Attorney Joseph Miller, Vorys, Sater, Seymour and Pease LLP., called Forensic Document Examiner Dennis Ryan, Rhode Island, New York, as a handwriting expert to testify. Ryan gave testimony on five of the signatures discrediting them as legitimate. Helvey said it was obvious that the same person had signed two of the names that were rejected at the hearing. “They were one above the other,” he said. Helvey said all signatures have to match the signature cards filed at the board. Once the hearing ended, the signatures had been narrowed to 281 from 285. For the referendum to be placed on the November ballot, 285 signatures are needed. Helvey said the law doesn’t allow printed names to be used as signatures, only cursive writing. He said he didn’t know what will happen in the future since many schools only teach print writing and not cursive. Andrea Yagoda, circulator, petitioner and township resident, defended the petition during the hearing. Yagoda said she lives south of the proposed development on 28 acres of land and the development doesn’t affect her property directly. She said her concern is with amount of development going on in the township. This entry was tagged Delaware County Board of Elections, Helvey, Herron. Bookmark the permalink.